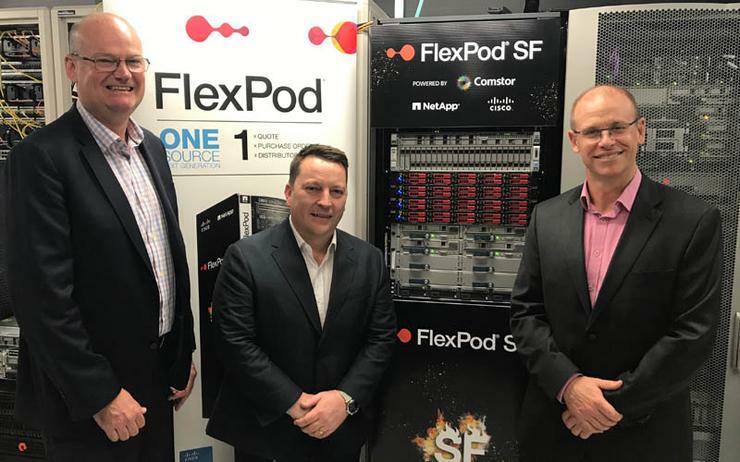 The FlexPod SF has landed on Australian shores, with Cisco and NetApp leveraging Westcon-Comstor to offer combined converged infrastructure solutions through the channel. Unveiled at an exclusive event in Sydney - following a global release in June - the FlexPod SF is a next-generation cloud infrastructure solution, delivered through an all-Cisco hardware platform. Powered by Cisco software and NetApp SolidFire Element OS, the combined components are designed to enable cloud strategies such as VMware private cloud, and open, emerging operating models like DevOps and OpenStack. From a partner perspective in Australia, Westcon-Comstor will be delivering the technology through the ONESource program, an initiative designed to capitalise on increased demand for converged infrastructure technologies across the country. “Traditionally, partners looking to sell FlexPod converged infrastructure needed to purchase the components separately from Cisco and NetApp,” Westcon-Comstor managing director David Gage told ARN. “This created complexity in trying to marry the components together, and required technical expertise most partners didn’t have. Available through the distributor’s dedicated Cisco arm - Comstor - Gage said the program offers in-house solution architects with specialist NetApp and Cisco certifications, alongside the management of deal registrations across both vendors. “Comstor build and configure the FlexPod unit in our state-of-the-art facility and can provide engineers to install it onsite if necessary,” Gage explained. Alongside finance options, Gage said the ONESource program is available in range of channel bundles, including Express; Select, DataCentre and FlexPod Solidfire. “Each has a single SKU, requires a single purchase order, and is delivered via a single distributor,” Gage added. Locally, Gage said the ONESource initiative has delivered more than 35 per cent of NetApp sales at Westcon-Comstor, with the distributor appointing a FlexPod Concierge to help meet demand. Specifically, this is a dedicated ONESource resource across both Australia and New Zealand (A/NZ), with the remit of supporting partners through the “entire process” of selling converged infrastructure. “Partners who would otherwise not be able to leverage opportunities to provide converged infrastructure can now attract a new range of customers at minimal risk and with minimal investment by using ONESource,” Gage added. “Secondly, partners strong in Cisco but lacking NetApp capabilities use ONESource to deliver FlexPod, letting the partner increase their NetApp capabilities. Previously, Gage said partners would order Cisco and NetApp products through different distributors, meaning items would arrive separately, leaving the partner with the complex task of configuring and provisioning the technology for the customer. “The partner had to manage a complex bill of materials for each vendor, plus all other aspects, creating significant risk and potential cost overruns,” he added. From a technological standpoint, FlexPod SF broadens the current FlexPod portfolio by supporting new workloads that require scale-out flexibility, automation and increase levels of performance. “The FlexPod SF gives customers who have enjoyed the unparalleled advantages of the FlexPod converged infrastructure the ability to take that reference architecture heritage across hundreds of applications and evolve if they choose in to a next-generation data centre platform,” NetApp channel director of A/NZ Neville James told ARN. “It’s incredibly important in Australia as we have the largest percentage of sales penetration for FlexPod of any country in the world. During FY17, James said NetApp’s FlexPod business grew 45 per cent year-on-year off a “substantial base” in Australia, reinforcing the importance of the product as part of the vendor’s go-to-market strategy at a local level. “The alliance with Cisco and Comstor goes from strength to strength on the back of FlexPod,” James added. The new solution extends the FlexPod technology portfolio that has been deployed by over 8,400 global customers and 1,100 partners across 100 countries, generating a total of $8 billion in combined revenue across Cisco and NetApp to date. “The launch of FlexPod SF is a result of continuous innovation over seven years between Cisco and NetApp,” Cisco A/NZ director of data centre Rodney Hamill told ARN. Hamill said of the thousands of customers worldwide that currently utilise the FlexPod product, many of these installations are highly optimised through a number of infrastructure use cases, particularly as part of Cisco Validated Designs (CVDS). “FlexPod SF is the latest iteration and innovation of the ‘Better Together’ partnership between Cisco and NetApp, which our A/NZ partners have leveraged successfully,” he added. Targeting the large end of town, the new solution is designed to support enterprise and emerging architectures with storage capacity, capacity tailored to the requirements of individual tenants in multi-tenant environments. “Enterprise IT organisations face a dual challenge; they have to maximise performance and value from existing mission-critical workloads while adopting new technologies that can speed digital transformation,” IDC research director Eric Sheppard added. “The adoption of private cloud solutions offers an approach that helps them more easily transition to the future.